On the left side of the screen, you should see a link named "Call Phone" in the Chat section. Click on that link, and a small dialer window will pop up in the lower right of your screen. Before you can make your first call, you'll first need to download Google's voice plug-in, which you can do by clicking on the link for it in the dialer window. You'll see a screen asking you to install voice and video chat. Install the plugin. 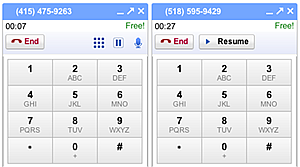 After the plug-in is installed, just reopen the voice dialer on your Gmail page and you can now make a call. If you wish to make a second call and not lose the first one, simply click on the "Call Phone" link in the Chat section again. Your first call will automatically switch to hold. And as explained in the Picture, clicking on the Resume button will let you switch back and forth from one call to another.